Oxfordshire, UK - One night, 106 years ago, a small cluster of men with a lifting derrick, ropes, block & tackle and muscle-power would have been seen in a wooded glade on the western bank of The Serpentine in Kensington Gardens. 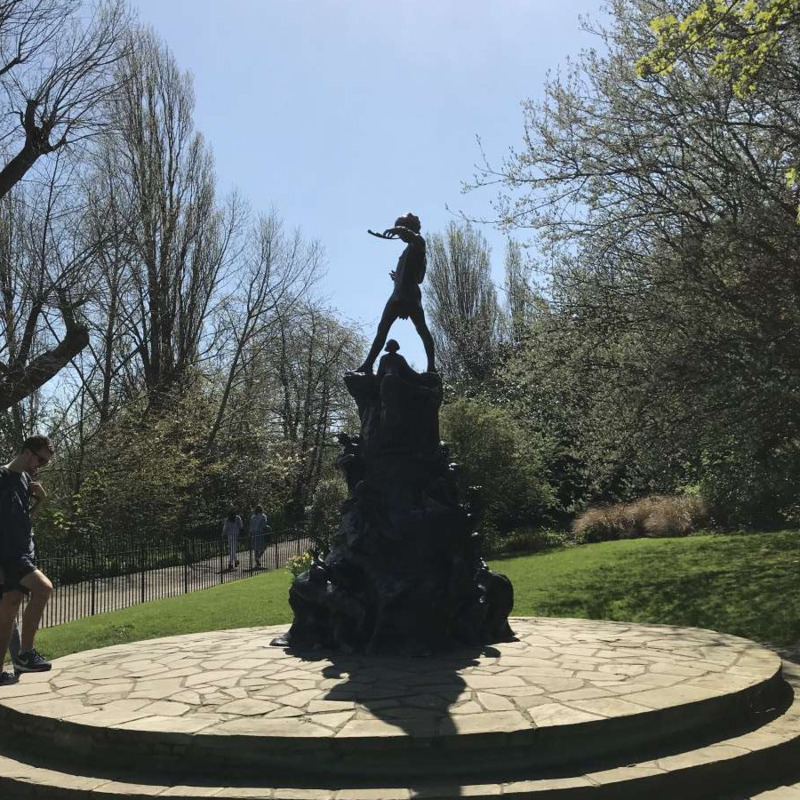 After darkness had fallen, at some point, their work completed, they would have slipped away; what they had secretly installed – a 10’ high bronze of Peter Pan – still stands there today. LASSCO is delighted to announce the very same occurrence this May Day 2018 – the same iconic bronze figure by Sir George Frampton R.A., has appeared overnight blowing his pipes at our Oxfordshire shop: LASSCO Three Pigeons. And this Peter Pan, atop his tree-stump teeming with fairies and rabbits, mice and squirrels (all bronze) is for sale. Very few casts of this sizable statue – including the base on which he is raised – have ever been made. There were two editions. From the first, commissioned by Barrie, cast by Frampton at the Morris Singer Foundry came the Kensington Gardens original and seven others. A later edition, overseen by The Fine Arts Society was then cast, again by Morris Singer, resulting in this piece and seven more – before the spent mould was destroyed. They are found in prime locations around the world, including Australia, Canada, Brussels and New Jersey. Remarkably, Barrie did not have consent from The Royal Parks to install the sculpture that night. He just went ahead and did it. There was some grumbling that ensued but such was the popularity of his gift that the statue has remained, and eventually, in 1987, it was granted Grade 1 listed status. J.M.Barrie lived in Kensington and chose the spot where in his stories Pan first flies from the childrens’ nursery and lands on the bank of the Serpentine. It was here that Barrie had first met the Llewelyn Davies family and had entertained the three young sons by inventing stories for George and John that their baby brother Peter could fly (ultimately the family grew to five brothers). The developed stories were first published in 1902. A theatre production followed in 1904. Barrie brought the Peter Pan stories together in 1906 as a compendium entitled “Peter Pan in Kensington Gardens”. And it was at this time that the idea for the sculpture was born – Michael Llewelyn Davies, the fourth of the five brothers, modelled the trademark Pan tunic for a series of photographs. Frampton would have had these photos as a starting point for the plaster rendition of this piece which made an appearance at the Royal Academy in 1911. It seems the statue was both a celebration and a poignant memorial – there are numerous veiled references in the stories to J.M.Barrie’s elder brother who had tragically died in childhood. The Edwardian public loved their surprise. 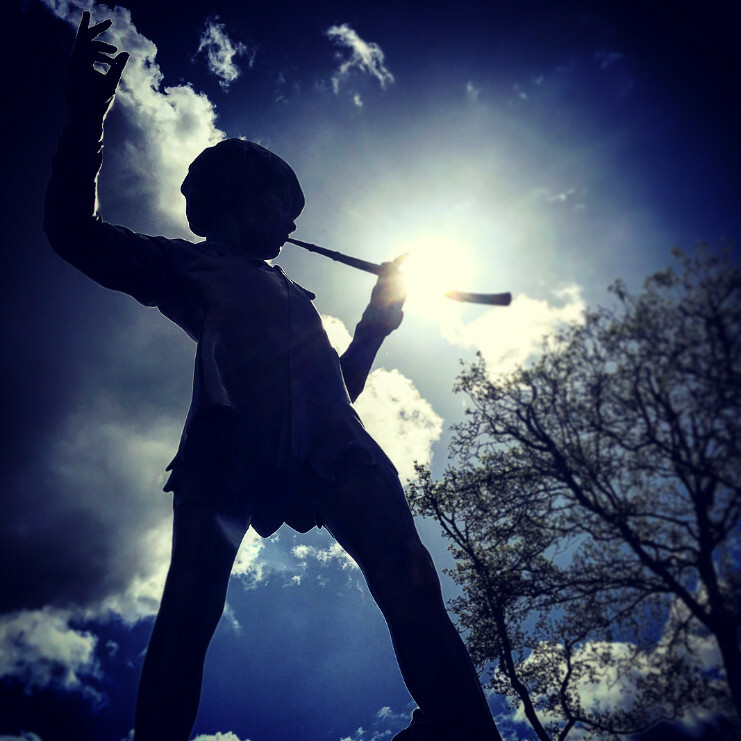 It is now a celebrated London landmark – a bronze boy who will never grow up. 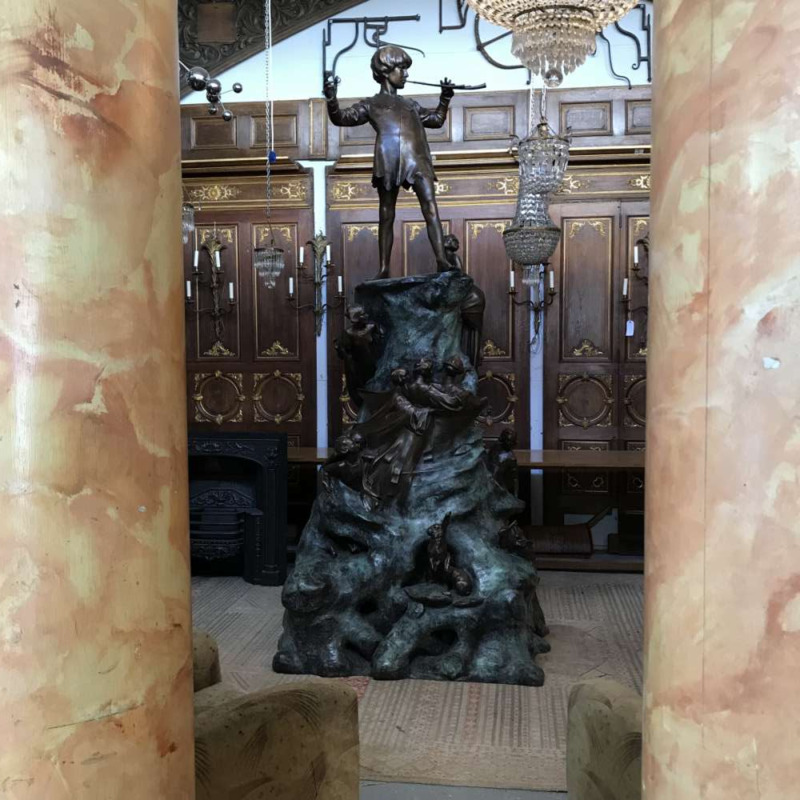 The Peter Pan bronze is for sale and on display at LASSCO Three Pigeons from May Day 2018. LASSCO: Peter Pan an iconic English bronze by Sir George Frampton R.A.